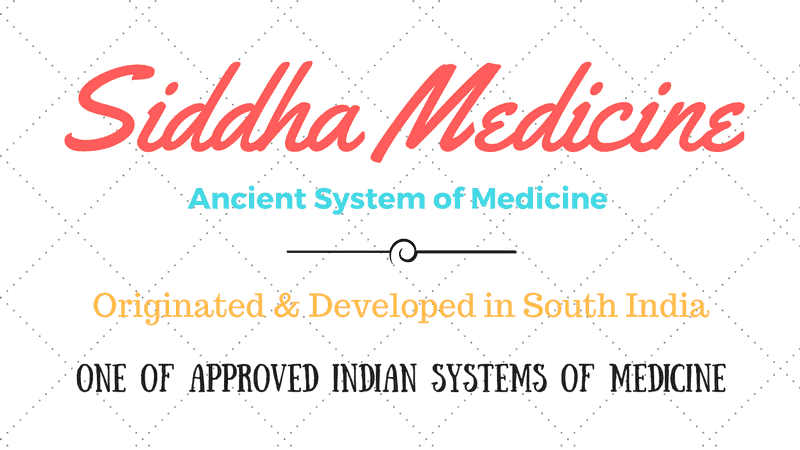 Siddha is an ancient system of medicine that originated in the south India. This system is believed to have originated several centuries ago or even since the beginning of the history of mankind. Many ingredients used for preparing Siddha Medicines are same as used in ayurveda. Siddha is one of the oldest systems of medicine discovered in the South India as a part of the trio, the other two being the Ayurveda and Unani. It is based on the principles similar to Ayurveda. According to the ancient Siddha texts, a human body is made up of several elements. It is a microscopic component of the universe. The elements that form a human body are the earth (MUNN), fire (THEE), water (NEER), air (VAYU) and space (AKASAM). Additionally, there are three humors or the DOSHAS called the Vata, Pitta, and Kapha. Siddha medicine believes that diseases occur when there is a disequilibrium or imbalance in these humors or if their individual harmony is disturbed. The balance can be restored by correcting the underlying dosha by the application of the Siddha medicine system. These three Doshas co-exist in all the cells of the body. They function in a harmonious manner to create a balance. Vata is formed by VAYU and AKASAM. It controls the sensory and motor functions of the nervous system such as sensation and movement. Pitta is formed by THEE (fire). It controls the metabolic processes in the body such as digestion, and assimilation, and helps to maintain the warmth of the body. Kapha is formed by NEER (water) and MUNN (earth) and controls stability. The three doshas are considered the three pillars of health and support the structure and functions of the body. These Tridoshas are involved in regulating all the functions of the body, and maintain the balance in the physical, emotional and mental spheres. Siddha system that originated in the South India derives its name from the term ‘Siddha’ which means an achievement. The practitioners of this medicine system are called the Siddhars. They need to attain the physical and spiritual excellence to be able to treat people. Eighteen Siddhars have been believed to have contributed towards the development of this system. The Siddha texts are in Tamil language and the system is practiced mainly in the Tamil-speaking parts of the world. It is believed that the place for the beginning of the human civilization as allotted to the mankind by the Creator was in the temperate zone and the fertile regions of the East, which includes India. Human race evolved in this region. Hence, India is considered the first country from which the human civilization began and spread. According to the Indian history, the Dravidians were the first inhabitants of India among whom the Tamilians were quite prominent. The Tamilians were also the earliest civilized humans. They made considerable progress in the civilization than the other ancient people. During those times, the languages of India were grouped largely into two classes: Sanskrit in the northern regions and Dravidian language in the southern regions. So, the Siddha science of medicine, which is of fundamental importance for the well-being and survival of humans and has its literature in the Dravidian Tamil language, is believed to have originated in the South India during the period the mankind evolved and developed as the civilization spread. The Siddha system was prevalent in the south India and the Ayurveda, which was largely in the Sanskrit language, developed in the north. However, instead of giving the name of any human as the founders of these medicine systems, our ancestors attributed the creator for their origin and development. Hence, Siddha medicine is considered to have been created by Lord Shiva, who unfolded the knowledge of medicine to his concert Parvati, who later handed it down to the Nandi Deva and the Siddhars. The Siddhars were considered scientists in ancient times. Though it is difficult to determine the exact point of time when this system originated, it is considered eternal. It began with the mankind and is expected to end with it. The food we consume and the medicines we take are also composed of these five elements. The amount and proportion of these elements in the medicines vary. It is their preponderance that is responsible for the medicinal actions and therapeutic results they produce. Siddha system considers a human body as a conglomeration of 3 doshas, 5 elements, and 7 basic tissues together with waste products such as sweat, feces, and urine. The food, which is the basic building material for the human body, gets processed into these body tissues, humors, and waste products to determine the balance of the doshas in the body. The equilibrium of humors ensures optimum health while any disturbance in these results in diseases. Siddha system also deals with the concept of salvation in life. Siddhars propose that the state of salvation can be achieved through the use of natural Siddha medicines and meditation. Siddha Medicine works by revitalizing and rejuvenating the organs. This helps to correct the dysfunctions responsible for causing the diseases. It restores the normal functioning of the organs and maintains the ratio of the three doshas – Vata, Pitta, and Kapha, thereby providing a healthy state of equilibrium in the body. No artificial chemicals are involved in Siddha medicine. Siddha medicine also believes that the universe consists of two entities. The Siddhars call these energies, the Siva (male) and Shakti (female, creation). It proposes that matter cannot exist without the energy inherent in it and vice versa. Thus, the two co-exist and are inseparable. It has 64 varieties of drugs prepared from minerals. These medicines are not soluble in water and are vaporized when put in the fire. Out of these, thirty-two are natural and the rest are artificial. Some medicines exhibit properties like sublimation on heating. These medicines contain mercury and its different forms such as mercuric chloride, red sulfide of mercury, and red oxide of mercury. The system has a separately classified group of medicines prepared from metals and their alloys, which liquefy when heated and solidify upon cooling. These medicines are prepared from metals like gold, silver, lead, copper, tin, and iron that are incinerated by special processes. Sulfur, which is insoluble in water, is also used for treating several ailments owing to its therapeutics properties. The Siddha system can help in treating several diseases although its use in the emergency cases is limited. This system is effective in treating most skin problems including psoriasis as well as urinary tract infections, hepatic diseases, general debility, digestive disorders, arthritis, allergic disorders, postpartum anemia, and fever. It is also effective in the management of viral infections, chronic inflammation, endocrine disorders, and functional disorders. Siddha medicine relies on the examination of pulse, eyes, urine, tongue, voice, skin color, and the status of the digestive system to diagnose diseases. This system provides a detailed procedure for the examination of urine including the study of its color, density, smell, oil drop spreading pattern and quantity to determine the cause of illness. The system advocates a holistic approach and the diagnosis is based on the study of the person as a whole and not just the examination of the affected parts of the body. The Siddha System emphasizes that the treatment of a patient should be based not just on the disease but also his physical, mental and spiritual state. It also takes into account the environment, age, gender, habits, habitat, mental frame, and the meteorological considerations while recommending the treatment. It also considers the appetite, diet, and physiological constitution of the patient. This means the treatment is individualistic and aimed at removing the root cause of the illness. What are Benefits of Siddha Medicine? Traditional Siddha medicine upholds maintaining the equilibrium of elements in the body and eliminating pathogens for treating diseases and boosting the health. It stresses on the importance of prevention of diseases rather than treating them. According to the Siddha medicine, diet and lifestyle play an important role in maintaining health and curing diseases. The medications are aimed at restoring balance in the body. Siddha medicines do not react adversely with the modern medications. Hence, patients who are using allopathic medicines can continue using the same while taking Siddha medicines, but keeping at least 3 hours gap between both. All Siddha medicines are natural and do not produce any side effects. Please discuss with a doctor.